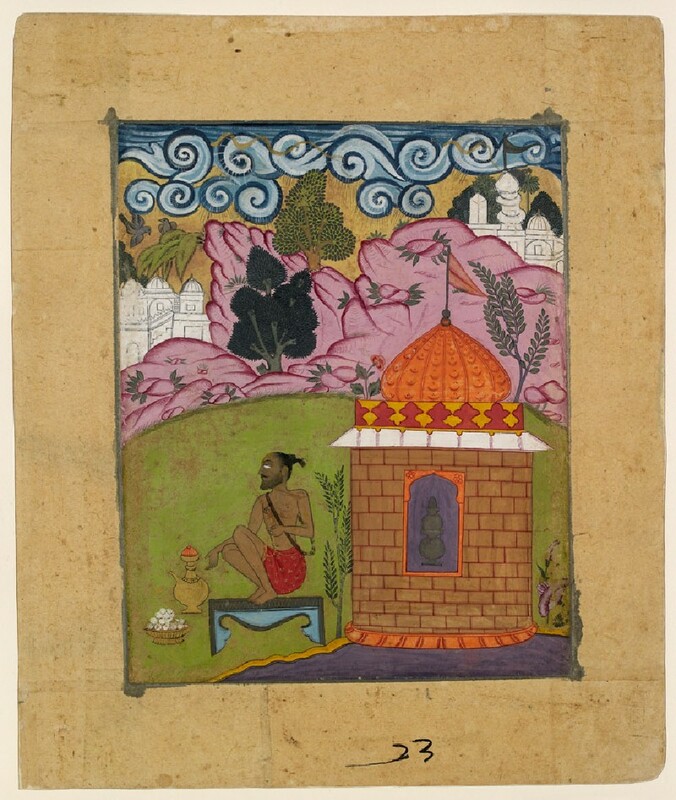 This representation of the mode Gund Malhar belongs to the same ragamala series as Asavari ragini [EA2012.229]. Gund Malhar is represented by a scene of a yogi or ascetic seated in contemplation outside his dwelling in a wilderness. This raga is also associated with the monsoon or rainy season, and spiralling thunder-clouds with serpentine lightning loom above the distant rocky landscape and palaces. The yogi’s hermitage is shown by the artist as a colourful domed structure, with stacked water-pots within a wall niche. 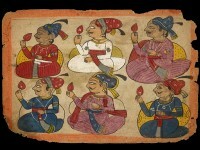 Raga (feminine ragini) are musical modes, often represented by compositions of ladies, lovers, warriors, animals or gods, in series of Ragamala ('Garland of Ragas') paintings, a very popular artistic genre in north India and the Deccan c. 1500 - 1800.